The Boeing B-29 Superfortress was a four-engine heavy bomber. It was one of the largest aircraft to see active service during World War II and was one of the most advanced bombers of its time, featuring innovations such as a pressurized cabin, a central fire-control system, and remote-controlled machine gun turrets. It was designed as a high-altitude daytime bomber, but flew more low-altitude nighttime incendiary bombing missions. It was the primary aircraft in the U.S. firebombing campaign against Japan in the final months of World War II, and B-29s carried the atomic bombs that destroyed Hiroshima and Nagasaki. Unlike many other bombers, the B-29 remained in service long after the war ended. By the time it was retired in the 1960s, some 3,900 planes had been built. 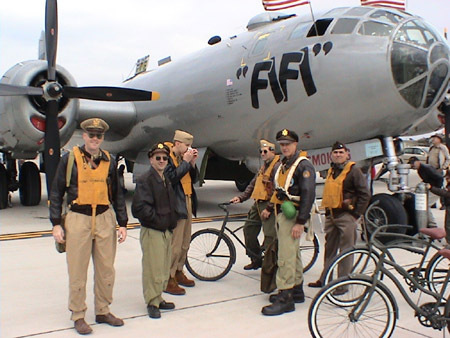 Today, there is only one B29 in the world still in flying condition - "Fifi," property of the Commemorative Air Force.